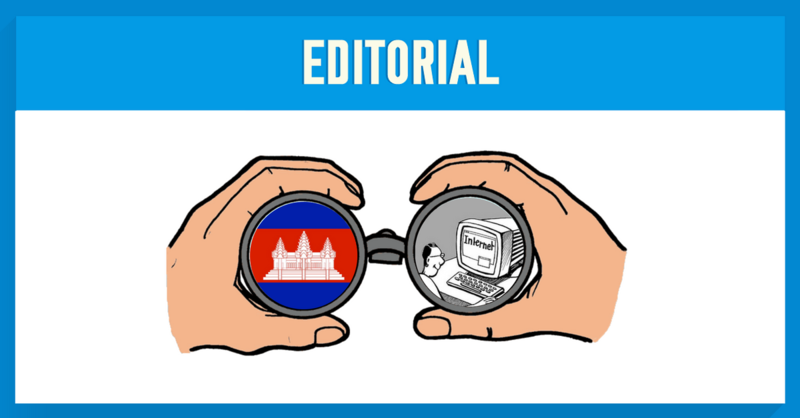 This year, Cambodia has slipped down four points in Freedom House’s ranking of internet freedom across the world. The main reasons for the lower rating were a series of arrests for undesirable Facebook posts and a much-criticized telecommunications law enacted in November 2015. According to opponents of the new legislation, it gives the government too much scope to track, investigate and prosecute Cambodian citizens. The concerns first started rising in June 2014, when the draft telecommunications bill was leaked to the public. The draft bill was set to increase governmental control over the administration of internet infrastructure and services, allowing the state to hold excessive power over telecommunications providers. The draft also appeared to authorize the Ministry of Posts and Telecommunications to install a central Internet Exchange Point to have more control on communications. Other provisions of the law criminalized online content considered critical of the ruling party. Following the public outcry, the National Assembly formally approved a new draft of the Telecommunications Law on November 30, 2015. This time, it had been “formulated with the purpose of defending the rightful benefits of all parties concerned,” including telecom operators, users, and the government. The law came into force on December 17, 2015, following a rushed legislative procedure, which lacked transparency and consultation. Despite the formal assurances, the law grants government officials access to telecommunications company data without oversight, putting the privacy of individual users at risk. For instance, Article 97 criminalizes eavesdropping by private individuals but still allows undeclared monitoring with approval from unspecified “legal authorities.” The law includes no legal or procedural security measures, and as such, appears to allow secret surveillance of any private speech via telecommunications, according to rights groups. Further, Article 80 punishes the “establishment, installation and utilization of equipment in the telecommunications sector” with 7 to 15 years in prison “if these acts lead to national insecurity.” Critics are concerned that this vaguely defined clause with the harsh penalties could be abused to prosecute legitimate activities. In order to protect your privacy, whether you’re in Cambodia, Brazil, Australia or the UK, you should use a VPN (Virtual Private Network). It securely connects you to the internet via an encrypted tunnel to a location of your choosing. Anyone attempting to intercept your communications will only see a jumble of information and not the content of the traffic. You should also look for a VPN provider that offers a strict no-log policy, such as NordVPN. That means no logs or records of your communications are kept by the service, ensuring complete privacy.